I t’s interesting that, at some point, a decision was made to choose “Outlaw Man” as the second single from Desperado rather than the title track. History (and a hugely popular hits compilation) have corrected the slight, and today “Desperado” is one of the Eagles’ best-loved ballads. By contrast, you don’t hear “Outlaw Man” on the radio anymore, and if you did you’d be more likely to identify it as the work of Neil Young. 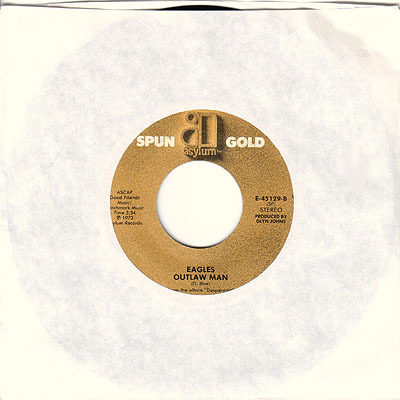 Written by David Blue, “Outlaw Man” is a more prickly critter than most Eagles songs, suggesting a cross between Neil and early Steely Dan. “Desperado” and “Outlaw Man” rode together at last on an Asylum 7-inch single of back-to-back hits, which marked the first time that “Desperado” appeared on a single.